After replacing the noisy extruder (Morgan0 did a beautiful job here) Morgan01’s prints improved… A lot. The Z backlash should be adjusted to the pint where the bed almost wants to drop down on its own when not powered. This allows a silky smooth movement, and is apparent in the consistency of the tube. The piece of tape on the bowden tube was used for the extruder calibration. Did not take it off yet. I love the precision and quality of these prints! I can’t wait to build one of my own. I was wondering though, how do you calibrate this design? Meaning how can you replicate repeatability so well in this format? As you have a rotational platform for the printer head, what method do you use for mechanical and code based calibration? 1. Make sure that the rotational end-stops are reasonably close to the programmed end-stop position. Only a rough alignment by placing the magnets in the correct holes. 2. Run the arm calibration. This involves the entering of special gcodes, moving arms to reference positions using the buttons in pronterface and reading off and entering the readings. I am working at making this ever easier in a future firmware update. 3. Run the armlevel (bed leveling) routine. Done. All of this can be done in 10 to 30 minutes. Oh so you aren’t using the standard end stop switches to measure max travel? If you are using magnets I’m assuming you’re using hall effect sensors? With these sensors, how precise is the positional stopping? Meaning is it very repeatable to the same point or does the sensor stop short depending on when it senses the magnetic field? When used in the way I employ it in Morgan they are very precise (repeatable). In this design the actual stop point is not important. As long as it remains the same, the calibration will take care of the rest. Hall effect sensors of this type are polarity sensitive, and when the magnet approaches from the side, the flux do not switch the hall effect logic until the poles line up. This ensures a very quick flux transition, and a very small error margin. Using software to calibrate mechanical systems in stead of relying on accurate mechanical calibration saves time in construction, improves quality, and lengthens service life. My Morgans travel a lot, and I never had to recalibrate before a show & tell. It has never been necessary. As an added bonus, the pin-outs of the hall sensors and the RAMPS pinouts match, making it a straight connection to the electronics. Thank you for the information on how you calibrate this and the benefits. I have one more question, do you have a starting auto homing calibration? If so what is your method of measuring/calibrating? If the auto home was slightly off, does it have the capability to self-adjust? I am still working on a viable auto homing solution for Morgan. It needs to be light, while at the same time will measure the table hight in the same spot as the hotend position. Makes it a bit tricky, but nothing is impossible. I am currently using a manual leveling script, where the user moves the hot end to touch the bed in various positions and enters a command to continue. After this is done, adjusting for variations in bed height is a quick one-step adjustment that can be saved to the eeprom, and will last until the bed is changed. There are still a lot to be done, and this will happen soon. I already have a list of things that will go into the next revision of the firmware. Here are just 2 cents to your Autohoming problem. 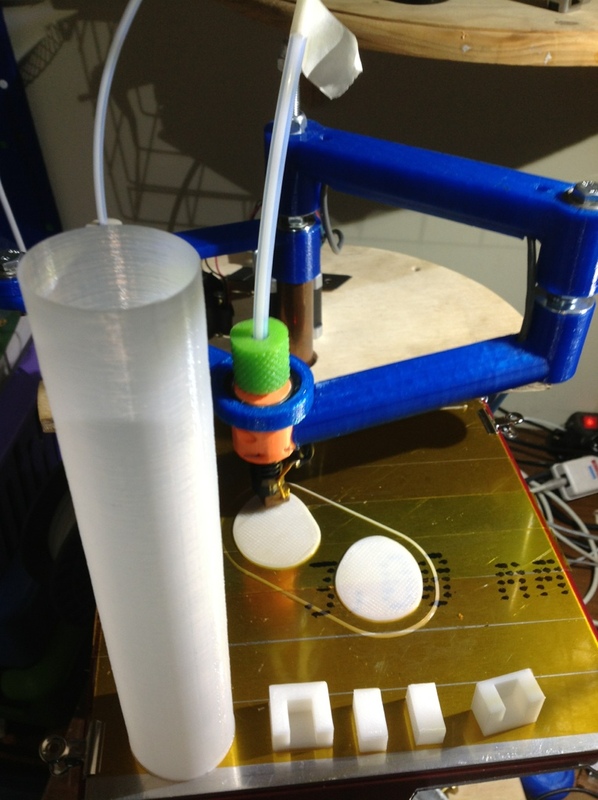 The Idea is to put a hall effect sensor near the extruder. Put the spare magnets in the table. Then write a searchroutine in the firmware and there you go. But thats only one idea coming to mind, when i was looking for some reusable electronic parts. I hope next time i will sit somewhere and have a cool drink. The only problem I can think of doing that is that the hall effect sensors are very sensitive to a specific amount of flux, which means you would have to carefully batch the magnets, not to mention to get the placement perfect. You would also have to do a manual offset calibration that would be cumbersome to non-technical users. It needs to simple, easy to use, reliable and fool-proof. I also thought about using sonar, IR, and inductive sensors, but it seems a mechanical probe still trumps the others in simplicity and cost. I got some ideas, yes. there is only the problem, that i only had the pictures and videos to look at the morgan. So there is a bit of time required before i can come up with a better solution. magicworx, who is going to use some more beverage for the flow.